My methodology for this exercise was simple. I looked at the 2018 schedule for each team and replaced each opponent with their 2017 fantasy-point-per-game average allowed to opposing outside wide receivers. 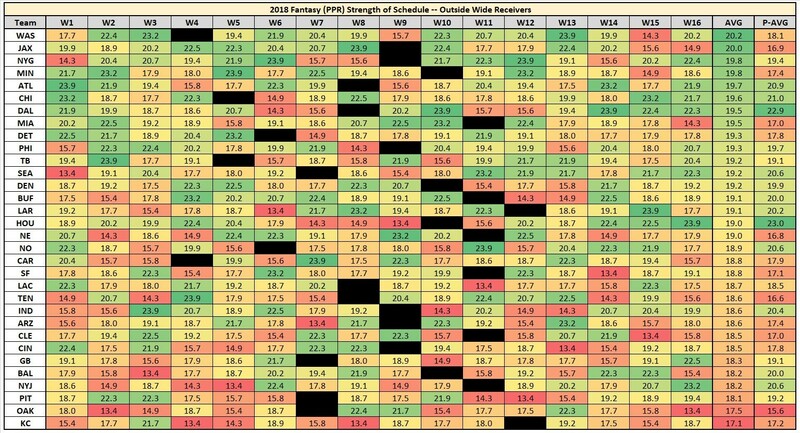 This should paint a decent picture of the season as a whole, a team’s fantasy postseason schedule (P-AVG), and weeks to stream or target players in trade. Unlike Monday’s article, today’s analysis will be focused on our second chart, which represents how much tougher or easier a team’s schedule will become in 2018. Most of the top-five and bottom-five remain the same, but now we have a per-game estimate of what this change means for fantasy. For instance, Arizona’s schedule looks about 1.13 fantasy points per game tougher this year than in 2017. 1. Minnesota Vikings – The Vikings have our most improved and fourth-best overall schedule for outside wide receivers. I think Stefon Diggs gets the bigger boost overall, running only 24.0 percent of his routes from the slot last season, to Adam Thielen’s 51.1 percent. For perspective, the Vikings have the 17th-easiest schedule for slot wide receivers. However, this could be negated somewhat by the fact that newly signed quarterback Kirk Cousins has targeted slot wide receivers at an above-average rate throughout his career, but targeted outside wide receivers at a slightly below-average rate. Last season, Thielen finished 10th in fantasy points per game, while Diggs finished 13th. I think both will see an efficiency boost due to the softer schedule and quarterback upgrade, but I have a hard time figuring out which wide receiver I want to draft first. Thielen was more productive last season, but Diggs was better toward the tail end of the year, averaging 6.5 more fantasy points per game over their final six games. I currently have them neck-and-neck in my rankings, with Thielen as WR13 and Diggs as WR14. 2. Indianapolis Colts – The Colts’ outside wide receivers have our second-most-improved strength of schedule, which should bode well for T.Y. Hilton if he remains outside in 2018. Hilton ran 57.4 percent of his routes from the slot in 2016 but saw that number decline to just 36.8 percent last season. This is worth monitoring considering Indianapolis has our second-toughest schedule for slot wide receivers. Hilton also might be in line for a significant production and efficiency boost, depending on the status of Andrew Luck. Throughout his career, Hilton averages 15.1 fantasy points per game with Luck in the lineup and only 11.3 without. For perspective, that would have been the difference between finishing 10th and 31st at the position last year. Inside the division, the Titans got a little tougher after signing Malcolm Butler, and Hilton will also spend two games shadowed by Jalen Ramsey (our No. 3-graded cornerback last year), but the schedule should still be much softer than in 2017 (second-toughest). Fellow wide receivers Ryan Grant and likely slot starter Chester Rogers don’t really inspire much confidence, especially with Luck’s status still uncertain. Hilton’s ADP (WR13) looks about right if we knew Luck would be ready for Week 1, but feels a bit too high at the moment. 3. Washington Redskins – The Redskins have our third-most-improved and best overall schedule for outside wide receivers. It’s likely not too surprising, considering Philadelphia’s Ronald Darby was our only top-35-graded cornerback from the division last year. This bodes well for Josh Doctson and Paul Richardson, but also for slot wide receiver Jamison Crowder, who has our fourth-easiest schedule among slot wide receivers. Docston has underwhelmed throughout his early career but should reprise his role as the team’s primary end-zone threat. 22 of his 78 career targets have come in the end zone (28.2 percent). For perspective, the next-closest wide receiver (by 2017’s numbers) was Michael Crabtree with only 18.2 percent. Considering he has only six career touchdowns to his name, if the end-zone volume sticks, Doctson should be due for some positive regression. While Docston’s fantasy value comes in the end zone, I think Richardson will play the role formerly served by DeSean Jackson, as the team’s primary deep threat. In 2017, Richardson’s 15.2-yard average depth of target ranked 12th-highest among all 50-plus target wide receivers. I slightly prefer Doctson, but like both as late-round sleepers. 4. New York Giants – The Giants have our fourth-most-improved and third-best overall schedule for outside wide receivers. This bodes well for Odell Beckham Jr. and… uhhh… yeah, I have no idea who will start opposite him. Slot wide receiver Sterling Shepard, who ran 83.8 percent of his routes from the slot in 2017, has our eighth-toughest schedule this year. The schedule disparity could funnel even more targets toward Beckham’s direction. New York’s NFC East opponents combined for just two shadow games last year, and one was Week 3 when Beckham faced off against Philadelphia’s Jalen Mills and totaled 28.9 fantasy points. The only other shadow cornerbacks on New York’s schedule are Jalen Ramsey, Marshon Lattimore, and potentially Richard Sherman or Malcolm Butler. 5. Jacksonville Jaguars – The Jaguars have our fifth-most-improved schedule and our second-easiest overall schedule for outside wide receivers. After losing Allen Robinson and Allen Hurns this offseason, draft pundits are marking this as an area of need for the team and are projecting heavy draft capital spent on the position this weekend. As it stands, we’re projecting Donte Moncrief and Marqise Lee to play outside with Keelan Cole in the slot. It’s hard to find a flattering stat for Moncrief, but I think he does have some touchdown upside if he sees the field. Cole did extremely well for an UDFA in his rookie year, grading out 29th-best at the position and ranking third in receptions of 50 or more yards. Lee is likely the best bet to lead the team in targets, though he ranked just 35th and 49th in fantasy points per game over the past two seasons. I wouldn’t sleep on Dede Westbrook either, who led the team’s wide receivers in snaps in the postseason, won the Belitnikoff Award a year ago, and was our most efficient wide receiver last preseason. With so many uncertainties it’s hard to get excited about any specific wide receiver, but all are currently fine upside picks at their bargain-priced ADPs. 1. Arizona Cardinals – Arizona went from having the second-easiest schedule for outside wide receivers in 2017 to our projected ninth-toughest in 2018. Somehow, they have our least-improved schedule, despite these numbers not even including the arrivals of Marcus Peters and Aqib Talib into the NFC West, and Richard Sherman changing teams but staying in the division. This bodes poorly for projected outside starters J.J. Nelson and Chad Williams – but no one was ever really excited about them to begin with. Perhaps this just means more targets funneled toward slot wide receiver Larry Fitzgerald. Fitzgerald ran 62.0 percent of his routes from the slot last year, and Arizona has a comparatively easier schedule for slot wide receivers this season (14th-easiest). Sam Bradford‘s proclivity for targeting slot wide receivers should bode well for his 2018 prospects. The 34-year-old Fitzgerald ranks fourth among all wide receivers in fantasy points over the last three seasons and is a great value at current ADP (WR18). 2. Kansas City Chiefs – The Chiefs have our second-least improved and overall toughest projected schedule in 2018, although the AFC West looks a little less fearsome with Talib now in Los Angeles. Tyreek Hill ranked seventh at the position in fantasy points per game last year and dominated as a deep threat. He carries a bit more risk this year with a new quarterback under center (Patrick Mahomes) and more competition for targets, after Kansas City made Sammy Watkins the fourth-highest-paid wide receiver in the league. Watkins’ production was disappointing in Los Angeles, but he was highly efficient on a per-target basis. Considering Andy Reid’s offenses have been historically unable to support multiple fantasy-viable wide receivers, and the significant monetary investment in Watkins, I’m starting to suspect Hill is a tad overvalued at current ADP (WR10). 3. Oakland Raiders – The Raiders’ outside wide receivers have our third-least-improved and second-worst overall fantasy schedule, but it might not be worth reading too much into their ranking here, considering the in-division losses of Marcus Peters and Aqib Talib. Amari Cooper struggled massively last year (especially with drops), but should rebound closer to his prior career average next season. Still, there are a few wide receivers I like more around his ADP (WR16). Jordy Nelson’s ADP is more palatable (WR25), but still not enticing, as he turns 33 and comes off of the worst season of his career. Still, he’s Nelson, a borderline Hall of Fame talent, and a historically great end-zone threat. Even if he’s lost a step, he could hit ADP racking up touchdowns (an area where Cooper has historically struggled) serving in the Michael Crabtree role (fifth-most receiving touchdowns over the last three seasons), but really, I’m trying to avoid Oakland’s offense altogether this year. 4. Pittsburgh Steelers – The Steelers have our fourth-least-improved and overall third-worst projected schedule for outside wide receivers. This might have some impact on Martavis Bryant, but this does little for my projections regarding the cornerback-immune Antonio Brown. Brown also had our single-toughest cornerback schedule last season, and that didn’t stand in the way of him finishing first at the position in fantasy points per game. Though this could mean more targets funneled toward slot wide receiver JuJu Smith-Schuster, who I’m very high on, considering Pittsburgh has our fifth-easiest schedule for slot wide receivers. Brown leads all wide receivers in fantasy points by an absurd 330.1 over the past five seasons, and he’s easily the top wide receiver in my rankings. 5. Carolina Panthers – The Panthers have our fifth-least-improved projected schedule for outside wide receivers. This bodes particularly poorly for Torrey Smith, who struggled mightily against top cornerbacks during his time in San Francisco. He’ll likely serve as the deep threat in Carolina, reprising Ted Ginn’s old role. Ginn finished 25th in fantasy points per game during his last year in Carolina (Cam Newton’s MVP-winning season) but finished outside of the top-50 in his other two seasons there. Devin Funchess was inefficient and underwhelming earlier in his career but averaged a respectable 13.5 fantasy points per game after Kelvin Benjamin was traded to Buffalo, good for 23rd-best at the position over this stretch. Impressively, he did this despite running 35 percent of his routes against top-30-graded cornerbacks over this nine-week stretch (11th-most). Current ADP puts him at WR25, but, considering the larger sample, that still feels a bit too high for me.